Philippine World Heritage Sites: How Do We Conserve These? “Heritage is a legacy from our past, what we live today and what we pass to the future generations.” says Boj, speaking in front of a community of travelers under Couchsurfing Manila. He is a fellow Filipino doing an internship with UNESCO National Commission of the Philippines and taking up his Masters degree in Urban Planning – National Park Planning & World Heritage Site Management in Peking University, China. The purpose of his talk is to raise awareness of our cultural and natural heritage. UNESCO (United Nations Educational, Scientific and Cultural Organization) is a specialized branch of UN (United Nations) with 3 major programs: conservation of world heritage sites, safeguarding of intangible culture and promotion of cultural industries and expression. The Philippines has five world heritage sites acknowledged by UNESCO: Four Baroque Churches of the Philippines (San Agustin Church in Intramuros, Miagao Church in Iloilo, Santa Maria & Paoay in Ilocos Sur); Puerto Princesa Subterranean River National Park in Palawan, Tubbataha Reefs Natural Park in Sulu Sea; the Rice Terraces of the Philippine Cordilleras in Ifugao and Vigan Town in Ilocos Sur. We also have two for intangible culture category: Hudhud Chant of Ifugao and the Darangan epic of Maranao. Puerto Princesa Subterranean River also made it to the New Seven Wonders of the World though the organizers are not in any way related to UNESCO. This however resulted to carrying capacity issues of the number of tourists is bad. There were also observations of lesser bat sightings under the river. Puerto Princesa which was once called as the “City in a Forest”, may not be no more because of changes. The Tubbataha Reef has excellent pristine coral reefs and high density of marine species. The Rice Terraces of the Philippine Cordilleras is a work of a genius because these were created by hand only but the designs and its durability to all climates of changes are praised by all engineers around the world. For example, it was crafted in a way that the water from the mountains on top can travel down laterally and horizontally without any help of modern technology. 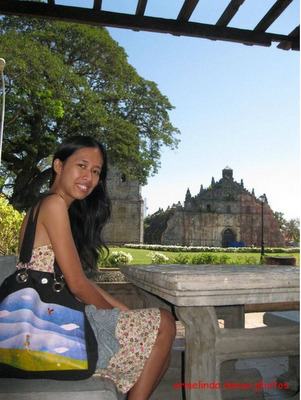 The Historic Town of Vigan is a perfect example of culture fusion between Asia and Europe. There was a question why is it Vigan is the only surviving Spanish colonial town in the country. I thought of the privileged geographical location, mighty fortress & people ready to die blah, blah but instead it is because of a love story. Then he said "Well, Vigan was saved because of love. A Japanese general, who was married to a Filipina went to the town’s parish priest before going to war and asked to protect his family until he comes back. The priest said sure only if Vigan will be spared by bombing of his fellow Japanese who are losing the battle against the Americans. So Vigan was not touched but the Japanese General died in the battle and was not able to come home." Okay, so what’s with the title anyway? Being in the list entitles that place a fund from the UN. This means an additional income to the local government and strong demand of its local products and services that will return a healthy tourism industry. There are still a lot of things of values and sites that are submitted from our country and waiting for confirmation. Here is the list. Our country, the Philippines has lots to offer especially if it’s about the richness of our marine and biological diversity. We just need more initiative from our dear government.